What is Skillz Drum Lessons? 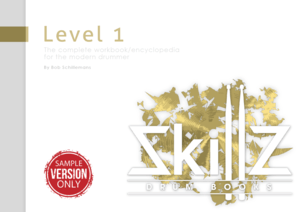 Skillz Drum Lessons is a company purely about drum education. We live and breathe rhythm and music. We offer the best structured online drum lessons based on our books. We also offer 1-on-1 (Skype) drum lessons at our studio, the Skillz Drum Academy located in the Netherlands. Do I have to get all three services/products from you? You most certainly don’t. You can get the Free Trial Version of our Encyclopedia Level 1 and you’ll receive our accompanying online video lessons as well. If you like it you can decide what will be best for you. We do have a few very interesting Introductory Super Deals and Special Lifetime Deals though. So if you want to save money, now is your chance! We most certainly do! We offer a 25% finder’s fee to our affilates. Like easy money? Come Join The Program! What is Skillz Drum Academy? Skillz Drum Academy is the division of Skillz Drum Lessons where we do 1-on-1 drum lessons. These can be done either by Skype or in person at our studio. Skillz Drum Academy is currently located in Echt, The Netherlands. You can check it out here. Can I fly in for lessons? Absolutely. We can arrange accommodations for specific timeslots. We have to schedule this a few weeks in advance though so be sure to contact us early. Do you have drumcamps I can attend? At the moment we do not. In the future we might so we’d love to hear from you if you’re interested. How should I study from Level 1?? First breathe in and out deeply a few times. Feel better? Good. Level 1 is meant as an encyclopedia of drumming and rhythm exercises. Who’s to say what’s the correct order, or how long it should take you to absorb all the knowledge inside? You decide. If you need help, visit a local teacher or check out our online courses here. Level 2 is a collection of chapters and paragraphs which can be added to the Level 1 material. Level 2 offers you in depth knowledge by getting into more detail about specific more advanced subjects. Absolutely! Besides viewing screenshots on the designated page (click button “More info” below) you can also register for a FREE Membership first to get a feel for how all of this works. If you like it you can upgrade your plan and download the added material instantly. Do I have to be an advanced player to start playing quintuplets? No you don’t. A basic understanding of rhythm and subdivision is advised though. What level do I have to be at to be able to start using Sub 5? I would recommend working out the wrinkles of playing in more common subdivisions first. Simply because these are needed more often. What is Skillz Drum Coach? Skillz Drum Coach is the division of Skillz Drum Lessons about online drum lessons. Which memberships do you offer? We offer three levels of memberships. When you sign up you get a code in your email. This code allows you to download Level 1 Trial Version once. You can now enjoy using our MIDI-player and Free Lessons. We’ll keep you in the loop of future updates, additions and special offers. Yes you can. If you decide to quit your membership you simply don’t pay again. If you want to stop your FREE membership you can opt out of the email list at any time. But the price you got when you enrolled may no longer apply if you decide to reapply. Daily if possible! Drumming, music and teaching are what we live for at Skillz. Not a day goes by without thinking about and developing new lessons. Since it’s all a proces of evolution we aim for uploading everything a.s.a.p. The sooner we upload, the sooner you can give us feedback. We welcome drummers of all ages. But it’s fair to say that the really young drummers won’t benefit as much from online drum learning. We therefore strongly encourage (young) children to seek the expertise and guidance of a renown local instructor. Don’t worry, we’ll see you in a few years! Do I need a private instructor? No you don’t. But you might benefit greatly from visiting one. It depends on your level of self analysis and introspection. A private instructor can give instant feedback as well as motivate you to get over the hurdles. But with our curriculum you certainly won’t need weekly private lessons. And you will gain an understanding of the big picture right away. So you will save money and loads of time no matter what. If you do, we need to get better. You need to make us get better. We need to hear from you. We have our Emergency Contact Form button for cases like these. As soon as you become a paying member you get to use this button which will be under the “My SDL” button. How’s that for caring about your custmers?! Holy drumming emergencies Batman!